It's only one day until Valentine's Day! I'm single so I won't be getting up to much, however, it does give me another excuse to paint my nails :) I used No.7's Red nail polish and then used a Claire's Accessories nail stamping plate to paint on white hearts. I have previously blogged about using the Claire's Accessories nail stamping plate here. The heart designs are another design of plate one from the set I purchased from Claire's Accessories. 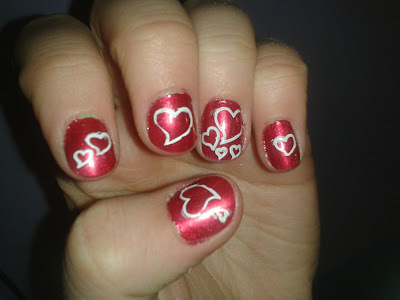 Has anyone else been creating some Valentine's Day themed nail art?